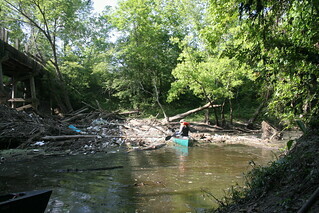 When I was planning the cleanup, I’d invited Mike, but it turned out he couldn’t make it due to prior commitments. No worries. 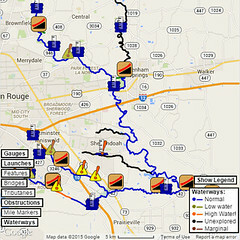 Then I talked to Neal, a friend of mine from the Bayou Manchac Group. He would be happy to come along and help, it seemed, so I had a second. Even better, he had access to a nice semi-private ramp to launch from, which made things logistically simpler. We penciled it in, and wouldn’t you know, Mike’s schedule opened back up, too. 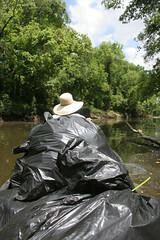 So, early Saturday morning, Mike, Neal, and I set off up Ward Creek toward the derelict bridge in two canoes and with plenty of big 55-gallon contractor trash bags. The water level was *very* low, so when we got to the upstream side of the Highland Road bridge, we had to get out and carefully pull the canoes along over the rip-rap. That was somewhat inconvenient, but on the other hand, the very low water level made the actual cleanup *much* more convenient. 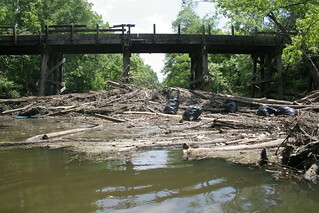 When we arrived at the derelict bridge, we pulled the canoes over and discovered that we could pretty much stand or walk (carefully) right on top of the flotsam-and-litter raft. Most of the litter-picking, then, was done on our own two feet (each), which made things go much faster than if were were stuck in the canoes. 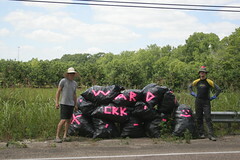 One after another, we filled 55-gallon bags with litter. Once we had everything visible bagged and ready, we took a quick side trip upstream to the other blockaded bridge, but Pecue Lane had very little litter behind it (which was certainly a pleasant surprise). 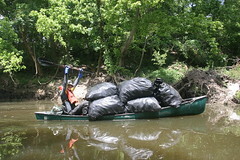 After paddling back to the derelict bridge and pulling the canoes over, we started loading bags. By that point, we had an even dozen (although we’d fill two more on the way back the vehicles). They were trying to think about what to do with the litter, but I knew better and took over at that point — you see, I’ve played *lots* of Tetris, hehe. I managed to load seven 55-gallon bags in my canoe. (I tried for eight, but there just wasn’t room.) The other five went with Mike and Neal. They had much better visibility than I had, so I settled for weaving like a tail-dragger biplane taxiing (with the occasional “LEFT! GO LEFT NOW!! !” shouted at me from the other canoe). We put the bags ashore at Barringer Foreman Road and carried them all to the edge of the bridge so that DPW could come and pick them up. (My little car can carry two on a good day, or three if I drive hanging out the door.) Then it was back to the launch and done for the day. Worth noting is that with the water level as significantly low as it was, we got a very good view of the blockages at the derelict bridge and Pecue. The bay we worked on at the derelict on Expedition One had a hidden trunk across it that is so huge that it is not going to be possible to open that lane. We’d need very low water and a very large chainsaw to cut through it to have any hope of budging it, and that’s out of scope of my project equipment. On the other hand, the far left side when facing downstream appears to be the “easy” way through on each of the blockages, so I think that’s where we’ll attack them. We only need a canoe’s width or few, after all.